RUSH: The Philadelphia Eagles story. You know what that turned out to be? 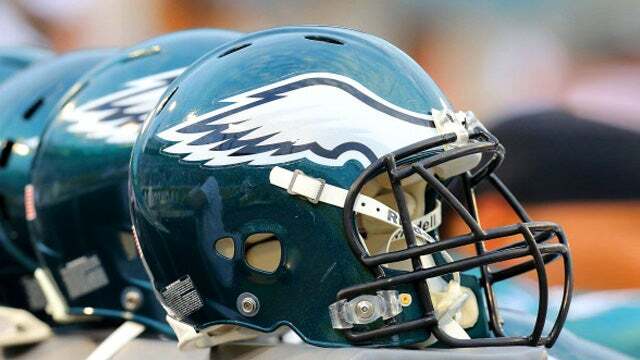 I think that… (interruption) Are you tired of hearing about the Eagles? (interruption) Well, I saw you shake your head. You’re mad at the Eagles? I think that it turned out… I think that was a setup. Because late last week the Eagles reported to the White House that their traveling party would be 70 people, and a bunch of people in Philadelphia, Eagles fans, made plans to be in Washington for the Eagles to be honored at the White House. They got hotel rooms; they traveled up there. And then earlier this week when the Eagles phoned in to confirm, they said, “Maximum 10 people, more like three to five, and only one player.” Nick Foles, the quarterback. That’s when Trump said… And the mascot, they were gonna send the mascot. Trump said, “That’s crazy. We’ll just cancel the thing.” But they had originally reported 70 were gonna show up. I think it was… I actually do think… I think it was an effort that they were going to try to humiliate the president. I think they were trying to finagle this so that Trump did the ceremony with only three to five people from the Eagles organization. I think that’s what their objective was, and Trump canceled so now they get mad at Trump and they start dumping all on him. But he was the one ahead of the ball, ahead of the game on this one. So chalk up another victory for Trump in an effort to undermine him and make him look bad. And I’ll guarantee you this: You’re not gonna see any stories on this. But on Park Avenue in New York where the NFL headquarters, this is not the kind of off-season PR they want! I mean, I don’t know how many of ’em in the NFL office hate Trump. There probably are some. But this is not what they want. The Super Bowl Champion football team openly refusing to go after committing to be there — and having it become this big, major story? Folks, believe me. The NFL knows they are not gonna sell an additional ticket because of this. Now, there are a bunch of idiots on the left who do not understand business who think that a plan or an event where Donald Trump is shown up or disrespected is gonna be appreciated so much by left-wing radicals that they’re gonna go out and buy tickets to the Eagles games or any other NFL games. That’s not how it works! Especially with a track record over the past two years of the NFL. The NFL owners passed a new rule: The players, if they’re on the field, cannot kneel. That is not kowtowing to leftist radicals. But I’ll guarantee you there were some people who thought that if the Eagles or any other team had pulled something like this off, that it would really resonate with the American people because these people all believe that Donald Trump is hated and despised. Since they do, everybody must. But people in-the-know at the NFL headquarters on Park Avenue are looking at this. This is not good. This is not good for the league. I mean, it’s traditional for championship teams to take a trip to the White House to be honored. And then to pull a little stunt where you’re only gonna have five to 10 people there, and then that becomes — like the coach of the Eagles, to give you an example, Doug Pederson is the head coach of the Eagles. And they’re in the middle of OTAs, organized team activities. These are the voluntary, involuntary off season practices that you really better attend if you’re trying to make the team. And I think they’ve got three of them this week and four of them next week. So he had a regularly scheduled press conference today, as all NFL head coaches do, to meet with the sports media to talk about OTAs, the practice, how the team’s gelling, how they’re coming together, how’s it looking for the upcoming season. 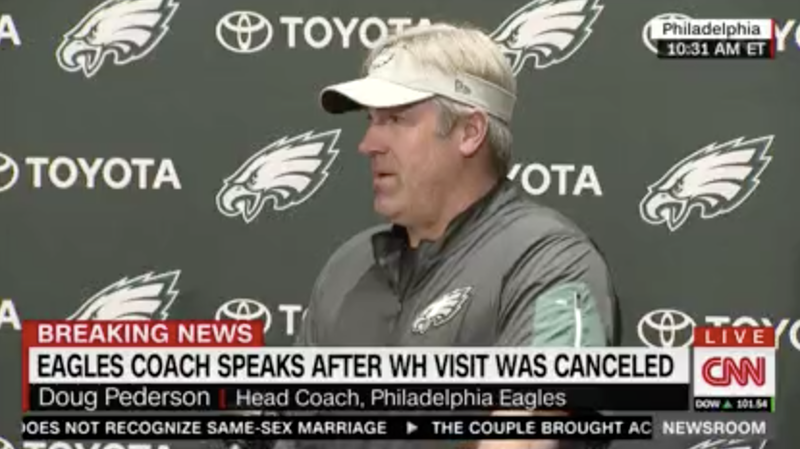 The Drive-Bys, the Drive-Bys today — I was watching — they told everybody that this press conference was Doug Pederson responding to what happened at the White House. He had no intention of talking about what happened at the White House. But I’m watching CNN, and they’re chomping at the bit waiting for it to begin, and they were right there when it did, and Pederson seemed a little taken aback. But he didn’t go there. He didn’t want to go anywhere near it. As far as he was concerned, that was yesterday. And in the NFL, we only look forward. And that’s a sports mantra.